Bruce is retired after guiding fishermen for forty years in the Hayward and Cable areas of NW Wisconsin and on Lake Vermilion in Minnesota. 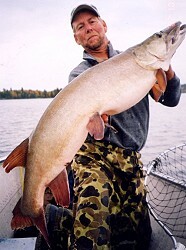 During this time, Bruce and his clients have had many record catches – muskies to 55 inches, and up to 50 pounds, as well as pike to 23 pounds, which have led to his reputation as one of the top “big fish” guides in Wisconsin. While Bruce no longer guides, he still spends 100 plus days each year on the water with friends and family.